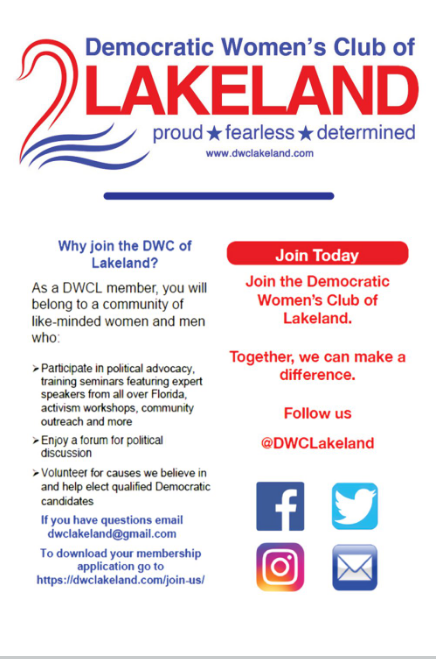 The Democratic Women’s Club of Lakeland will hold our monthly meeting on February 25th, 2019 at 1515 Williamsburg Square, Lakeland, FL 33803. Please join us for our monthly meeting beginning at 6:30 PM. Social time begins at 6:00 PM. Non-members and members of the press are asked to check in at the sign-up table. If you are interested in joining our club, you will be able to do so at this event. Light refreshments will be available and our meeting place is wheelchair accessible. If you would like more information about this topic, please contact Jan Barrow or Donna Windsor at 863-825-5145 or email at dwclakeland@gmail.com.